Monopartite linear ssRNA(+) genome of about 9 kb. 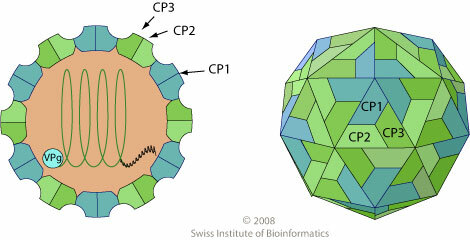 The 5' terminus has a genome-linked protein (VPg). The virion RNA is infectious and serves as both the genome and viral messenger RNA. The genome single (or major) ORF is translated into a polyprotein which is subsequently processed by virus-encoded proteases into functional products. ETYMOLOGY sequi: from Latin ‘to follow, accompany or attend’ in reference to the dependent aphid transmission. GEOGRAPHY PYFV: UK, Germany and the Netherlands. ASSOCIATED DISEASES PYFV: vein-yellowing, yellow flecks and yellow/green mosaic symptoms in parsnip, and ‘yellow net’, followed by yellow spots and leaf distortion in celery. TRANSMISSION Mechanical, vector=insects (aphids, Cavariella aegopodii and C. pastinacae). Aphid-transmission depends on the presence of a helper virus (helper protein-dependent encoded by the Anthriscus yellow virus).